Accessa is inside our customers’ facilities on a daily basis. Spotting a company that makes quality a top priority across the board is pretty easy. There is a level of organization, attention to detail, cleanliness and pride in these places that you don’t see on every manufacturing facility floor or front office. These companies also happen to be some of our most successful customers. It’s not by accident. 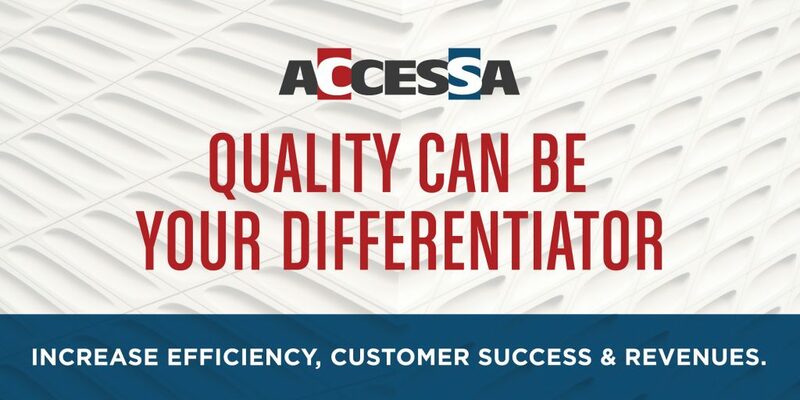 Let’s take a look at how attention to quality can impact a range of areas to help Accessa customers be more successful. Your product is, perhaps, the most obvious place to start a conversation about quality. If you have a shoddy or even status-quo end product, business can suffer in the short and long term. In our experience, when customers commit to manufacturing high-quality products, they are essentially investing time and money to keep current customers and attract new ones. This is a major reason we carry high-quality coatings and chemicals. True product quality is multilayered. Products are typically made up of a substrate and raw materials such as hardware, mechanism parts and coatings. Companies buy parts and pieces from various vendors and partners. To measure the quality of the finished product, you have to consider the quality of each element of its makeup. Particular just to coatings, factors such as durability, ability to protect the substrate, and resistance to chemicals come into the equation, in addition to aesthetic qualities. Additional aspects are at play when you analyze other raw materials. Of course, if you aren’t an expert on the parts of your product or don’t have an expert to guide you, weighing the pros and cons of raw materials can muddy the buying-decision process. Oftentimes, customers default to price to be the decisive factor, which might be the easiest way, but it’s often not the best way. 1. For several years, we have had frequent quality-related discussions with customers in the wood coatings industry around the choice between conversion varnishes and polyurethane coatings. Conversion varnishes emit formaldehyde for up to 20+ days after application, but they typically are less expensive than polys. But as consumers become more savvy to environmental hazards, poly continues to gain ground (it doesn’t emit formaldehyde). This feature is a major factor in evaluating its quality. When we are evaluating coating choices like these with customers, keeping quality at the top of our priority list helps us make expert recommendations for short-term and long-term business success. Sometimes a less expensive coating can provide the level of quality we need to attain. In other situations, a customer might purchase a more costly option to ensure they achieve a higher level of quality. It’s rarely an “either/or” decision. 2. The same is true with metal coatings. Think about polyurethane, enamel and epoxy coatings. Now consider where the end product will be used. Will it be exposed to sun, heat and rain? Does it need to retain its fresh luster for years to come? If you deliver a product that fails to deliver on its promise of high quality after a month or year, how will that affect your relationship with the customer? If you tend to approach customers in a more transactional manner than a relational one, the disappointed customer is likely to consider other vendors before you even have a chance to manage the issue. Overall product quality starts with what goes into it, which can quickly trickle down to whether you retain customer relationships. 3. To further illustrate the importance of product quality as it relates to your profit margin, let’s look at a chemical products example. A job shop tasked with cleaning and painting metal parts relies on an inexpensive, two-in-one cleaner/coater product. When a shipment of metal coated with a wax-based rust preventive (RP) comes into the shop and is put through the pretreatment line, the cheaper cleaner/coater can’t sufficiently remove the RP. As a result, dried powder coating flakes off the metal due to lack of adhesion. The shop now has a massive rework project on its hands. It falls behind its promised deadline, and the customer is not happy. Time and money are wasted, and the shop is scrambling to replace revenue this unhappy customer might have brought in before the mistake. Even if other elements of the manufacturer’s process had been perfect, the lack of attention to chemical quality in the cleaning and coating products prevented the shop from executing a successful job. When Starbucks announced its plans in 2017 to open a new location on Chicago’s Magnificent Mile in 2019, it was not just another retail store. It was a Starbucks Reserve Roastery, an interactive four-story, 43,000-square-foot space, luxuriously appointed and staffed, and featuring specialty drinks and signature cocktails. Such an elevated brand promise requires the same level of quality from top to bottom. In this case, coatings from Accessa were chosen to beautify and protect many of its wooden features and furniture. Starbucks has grown into a symbol of product consistency and quality across 29,865 locations around the world. Quality control around coffee beans, flavorings and food products has to be rigorous, but the rigor can’t end with the obvious consumables. Its bustling storefronts must stand up to nearly constant impact from coffee-swilling customers. If the people who designed and built Starbucks stores chose furniture, equipment and technology based on what they’ve always used or what had the lowest price tag, business would not be booming. The infrastructure and aesthetics simply could not tolerate the human impact. Likewise, if they purchased the most expensive options, assuming they were the highest quality, they would likely burn through their money too fast. Instead, they factor in cost while keeping quality a top priority. For companies large and small — from Starbucks to your local dry cleaner — living up to what your brand is promising to deliver is necessary to survival. If sales and marketing teams are talking about world-class products, you better manufacture world-class products or adjust their expectations. Quality alignment is key. Of course, choosing the most expensive product available is not the answer. Vendors selling essentially the same product can charge vastly different prices. In many cases, and most often in the coatings and chemicals industry, detailed specifications guide buyers to the product or product range they need. These specifications are put in place to achieve the necessary level of product quality and performance. There is no need to purchase a coating with a Class A rating when you really only need a Class B. However, when you are in a position to weigh the pros and cons between two different products with the same specs, consider quality beyond what you see on a spec sheet. What is your experience with or the reputation of the product manufacturer? What is the level of customer service and responsiveness behind each product? What kind of technical support would you have with each product? If one product is vastly different in cost from the other, why is that the case? When you make purchasing decisions, having choices is critical. As a distributor of hundreds of products from multiple vendors, Accessa can hold manufacturers accountable and offer customers options. This way of doing business is necessary to achieve the level of quality we demand at Accessa. The same should be true when it comes to your purchase of any raw material, product, substrate or technology. Businesses that demand choice and ask the hard questions are setting a foundation to have more efficient, effective internal processes, and build longer-lasting buying relationships with customers. To use quality to your full advantage, it must also be part of your operations. This includes your finishing or application systems. Because Accessa serves a range of customers, and our consultants are often hands-on in their facilities, we are able to help diagnose inefficiencies and find ways to increase operations quality related to coatings and chemicals systems. Likewise, trusted partners in matters related to areas such as equipment, waste disposal, energy usage, inventory and logistics can be invaluable to increasing your overall quality. A common challenge we run into is finding the most efficient balance between coatings costs and labor. For example, we have talked to people who use less-expensive, lower-solids coatings who end up putting three or four coats on their substrate instead of using a more robust coating and getting the job done in one or two coats. These people tend to be fixated on cost per gallon. Applied cost analysis should certainly be considered. To analyze these kinds of issues on the electrostatic coatings side, we look at rates of transfer efficiency — essentially how much paint is actually adhering to the metal during the application — combined with the aforementioned factors, to formulate an applied cost. It can be eye opening for a lot of Purchasing personnel. In the long run, cost per gallon might not be better. The type of gun in use and other equipment in your systems play just as important a role in determining value as the coating does. It all comes down to a capital outlay. Manufacturers of any size with fixed assets such as equipment yield more efficiencies and more throughput by investing in quality. This approach leads to higher profits in the end. This sort of investment is one you likely will need to plan for — it’s not going to be a small purchase up front. We get it! Accessa is currently investing in new color-dispensing equipment that will yield increased color matching accuracy. We have also recently deployed equipment to tint larger volumes of colors more quickly and efficiently. These are changes that will increase our overall quality, so we can extend that to our customers. On the customer side, we can help identify if potential investments in equipment or systems are smart business moves — and support overall quality. A customer was recently weighing whether his company should move to a non-phosphate system. The switch would require changes to tanks and other equipment, which would be painful in the short term. The savings on gas bills and other areas, though, would likely make the tough transition well worth it. As a partner, we can help walk customers through those options and opportunities. In a similar vein, customers should also examine how efficient their drying process is. Is air drying slowing down throughput? Is forced drying in ovens driving up energy costs unnecessarily? All of these elements are part of the quality equation. Our team at Accessa understands that our products are market leaders in their respective categories. We preach continuously about this, and the need to back that up with the same level of quality service and support. Setting up your team to adopt a quality mindset is more than printing a banner that says “Top Quality.” At Accessa, it stems from the professional and competitive mindset of our ownership and management team, and trickles down to become a point of pride throughout the company. Use our quality mindset to your advantage. As a partner to you, Accessa can help identify and support your quality goals. Please get in touch to learn more.